When you are stitching and need to pause for a few minutes or get your next length of thread ready, where do you put your needle? It's far too easy for needles to go missing during these moments, but a ​magnetic needle minder helps avoid this problem. And they are so easy to make! The important part of a needle minder is the magnet because it holds your needle in place, but the base is where you can really customize your own. There are lots of different needle minders available to buy, and you can find them with just about any design you can imagine, but when you make your own, you get exactly what you want. You can infuse your personality into it and have a stitching accessory that you made yourself. A needle minder needs two magnets: one that is attached to the needle minder and one that is loose to hold it onto your work. The magnets should be strong enough to hold together and magnetically hold the needle through the base. Neodymium magnets also called rare earth magnets, come in different sizes. These are a good choice because they are very strong, but also slim. Usually the larger and thicker the magnet, the stronger it is. Ceramic magnets are also strong enough to use for needle minders. These magnets are thicker which makes them harder to lose. However, sometimes the poles of them can cause the two pieces to misalign. As long as your magnets hold to each other, and create a strong pull through the base, they will work. Lots of things will work for the base, as long as they are small and thin. Buttons are a great choice. 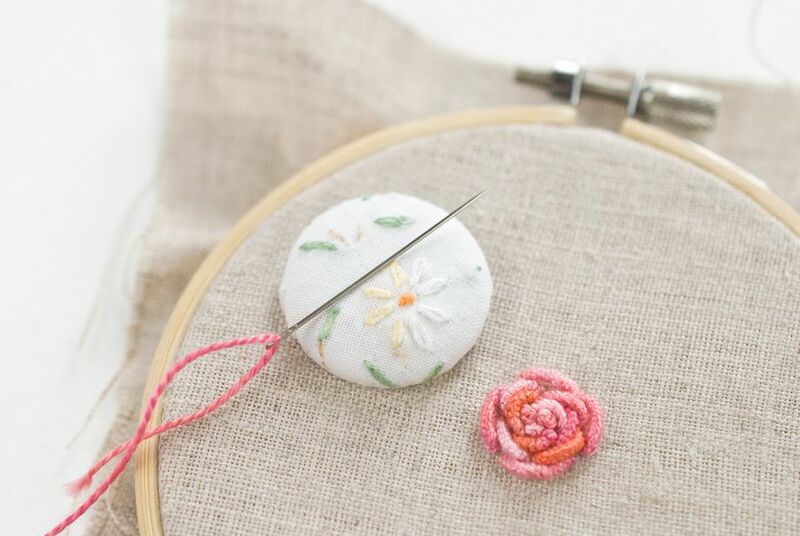 Vintage buttons are often beautiful and making them into a needle minder gives them new life! You can also use decorative or covered buttons. If they have a shank back, you will need to remove that part so the back of the button is flat. Wooden discs work well and they can also be customized. Paint them with acrylic paint, decoupage them, or embroider a simple design. Small toys are another option that you may have around the house. Again, as long as they are thin, they will probably work. 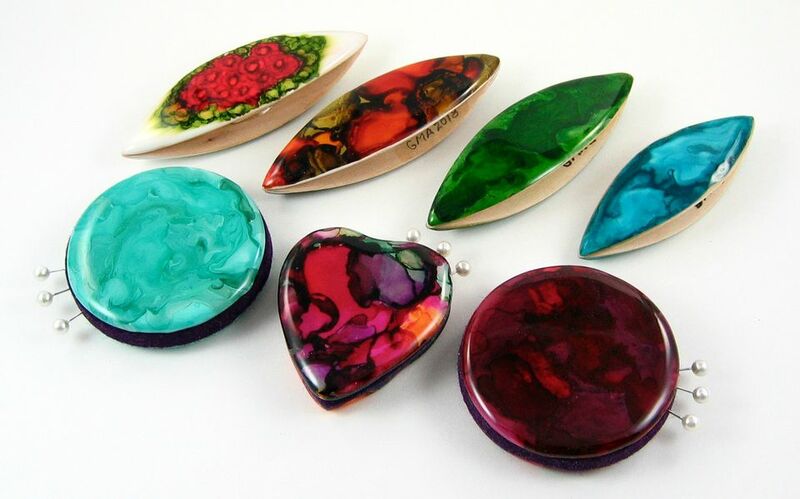 Cabochons are a popular item to use when making needle minders, as they come in so many styles and designs. Look for them in craft supply stores or online. The important thing is to test your item before you glue it all together. Hold the two magnet pieces behind the base and place the needle on the base. If the needle clings to the base when you give it a shake, you're all set! Because the magnets are meant to hold tightly to each other, it's important to choose an industrial-strength glue, such as E-6000, that won't come undone when you separate the magnets. Squeeze a small amount onto the back of your needle minder base. If you're using a button with holes to the front, try to avoid lots of glue right around the holes. Press one of the magnets into the glue. If the glue squishes out around the magnet, that's okay! Let the glue dry for several hours, or even overnight. This is important, because if the glue isn't completely cured before you use your new needle minder, you may get glue on your embroidery work or the magnet may pull off. To use your needle minder, hold the base piece to the front of your hooped embroidery work. Place the second magnet on the back of your work so that it attaches to the base piece. The needle minder will stay in this spot and you can set your needle on it as needed. No more lost needles as you work! It's a good idea to remove your needle minder when you're done stitching for a time. Now that you can make your own needle minders, you can make one for every project in your work-in-process pile. They also make excellent gifts for all of your stitching friends! Stitch a Favorite Halloween Treat to Wear for Fall!